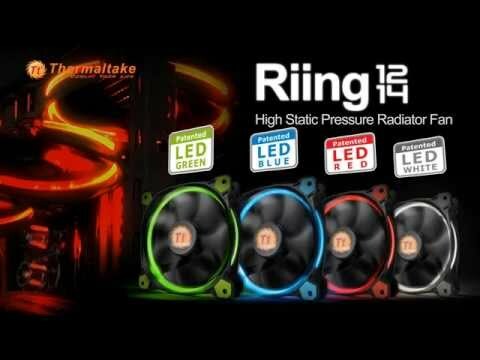 Product Overview The latest Riing Silent 12 CPU cooler is with PWM function, designed for use with high-end RAM and motherboards. Taiwan Patent: M498806. China Patent: CN204498539U. US Patent: 14/702,806. Riing Silent 12 delivers outstanding cooling performance, keeping the temperature between 30? and 32.5? (ambient temperature is 20?) @Intel® Core™ i7-4770K 3.8GHz at full load. Optimized 0.4mm thickness aluminum fins with 2.2mm air gap, and 4 x Ø6mm solid copper heat-pipes are designed for rapid heat dissipation, allowing maximum heat conductivity. The tower’s side flow design delivers the best cooling performance. In addition, the heat-pipes are in continuous direct contact with the CPU to ensure fast and efficient heat dissipation. • 4x Ø6mm U-shape copper heatpipes. • Aluminum fins with 2.2mm air gap. • 4x heatpipes directly contact with the CPU. ThermalTake Riing Silent 12 Blue Single Tower CPU Cooler, 4 Heatpipes,120mm PWM Fan, Blue LEDs, Al/Cu, for Intel/AMD is rated 5.0 out of 5 by 1. Rated 5 out of 5 by leeeww from THIS THING IS A BEAST i had to turn the heating on in the house to stop the area around my tower freezing over because of this monster.